Dr. Daniel Weldon, of Weldon General and Cosmetic Dentistry, is highly qualified to evaluate your teeth, gums and bone to provide a recommendation regarding the need or indication for dentures. Dentures are one of several treatment methods for the replacement of missing teeth. In addition to the teeth, dentures replace what is missing from the surrounding supporting structures (gum tissues). There are two main variants of dentures; complete dentures which replace all of the teeth in the upper and/or lower arch and partial dentures which are designed to replace some of the missing teeth. Dentures can be utilized when teeth are missing from tooth decay, periodontal disease, or trauma. The results can be transformative and can provide a return to necessary form and function. Weldon General & Cosmetic Dentistry offers a myriad of teeth replacement options for the residents of Ocala and surrounding communities. There are many ways that teeth can be lost. Decay, trauma, and periodontal disease are common. Any time teeth are lost, dentures can be considered. Aside from normal chewing, there are several reasons why dentures can be a benefit. First, when there are some missing teeth and some remaining healthy teeth in the mouth, there can be movement of the existing teeth due to the lack of support that the natural teeth provide. This can create more unsightly gaps, be problematic when eating, and often requires braces to correct. Additionally, when teeth are missing the face tends to sag inward which creates the appearance that the person is older than they actually are. Many people who have lost teeth also find it challenging to speak adequately. Finally, the social impact of missing teeth cannot be overstated. Patients who have missing teeth report that they often avoid social situations, meals with friends, and find themselves covering their mouths when laughing or smiling. Dentures can truly be transformative by correcting these problems. Partial dentures are utilized when there are missing teeth but healthy teeth still remain in the mouth. 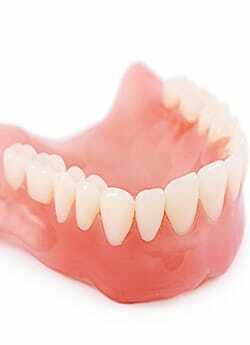 A partial denture consists of acrylic or porcelain replacement teeth attached to an acrylic gum-colored base that is held in place in the mouth by a metal framework. The crowns that are attached to the base are designed to look just like the natural teeth. The denture is retained in the mouth in part by the existing healthy teeth. Partial dentures can be of benefit in several ways. In addition to a return of eating function, partial dentures can also provide a significant difference in the esthetics of a smile. Also some patients who experience a sagging inward of the face due to a lack of teeth will experience a return to a normal appearance that is age appropriate. Finally, speech can be restored with the proper anatomy of partial dentures. Complete dentures are indicated when all of the teeth in the upper or lower jaw are missing. Complete dentures are constructed of an acrylic gum colored base attached to either porcelain or acrylic teeth. The dentures are retained in the mouth in part by the anatomy of the remaining structures in the mouth. Do I Have to be Without Teeth During the Healing Process? This is a common question. Many people who obtain dentures have been without teeth for a period of time. There are others; however, who have existing teeth in the mouth that for one reason or another have to be removed. The best denture results come when teeth are removed and the bone and soft tissues are allowed to heal before the denture is delivered. For those that are unwilling or unable to spend time without replacement of teeth, immediate dentures can be used. These dentures are given to patients the day the teeth are removed. While these dentures may be ill fitting for a period of time during healing, they provide a temporary replacement. Eating, speech, and social situations can be easier during this time. Dentures are retained in the mouth in several ways. They are; however, not perfect. Patients often report their dentures slip, slide, and rock in the mouth. Overdentures are a way to minimize this effect. An overdenture utilizes dental implants to help retain the denture in the mouth. Specialized attachments are fixed to the denture as well as the implant. This allows the denture to snap in the mouth like a snap on a shirt. The result is a denture that is retained in the mouth better and an increase in chewing force of 60-200% over complete dentures. There are other ways teeth can be replaced. Bridges and implants are both possible alternatives to dentures. Dr. Weldon would be happy to discuss the benefits and drawbacks of each of these methods and how they could benefit your particular situation. Dentures require care for many of the same reasons that healthy teeth do. Dentures need to be brushed each day for the removal of food deposits and plaque accumulation. Brushing dentures will help prevent permanent stains. A specifically designed denture brush consists of bristles that are properly spaced to fit the shape and contour of the denture. Your dentist will also provide information on a denture cleaner. Dentures can lose the designed shape if not kept moist. To prevent this the dentures should be stored in a denture soaking solution or in water every night. If you would like to discuss your options with a qualified dentures dentist in Ocala, contact Weldon General and Cosmetic Dentistry to schedule a consultation.